These days everything is tending to get smarter and smarter. Coffee cups had not seen much advancement since their invention, until now. The smart coffee mug by Ember keeps your coffee hot all day long. The company Ember has released two versions of this smart coffee mug. 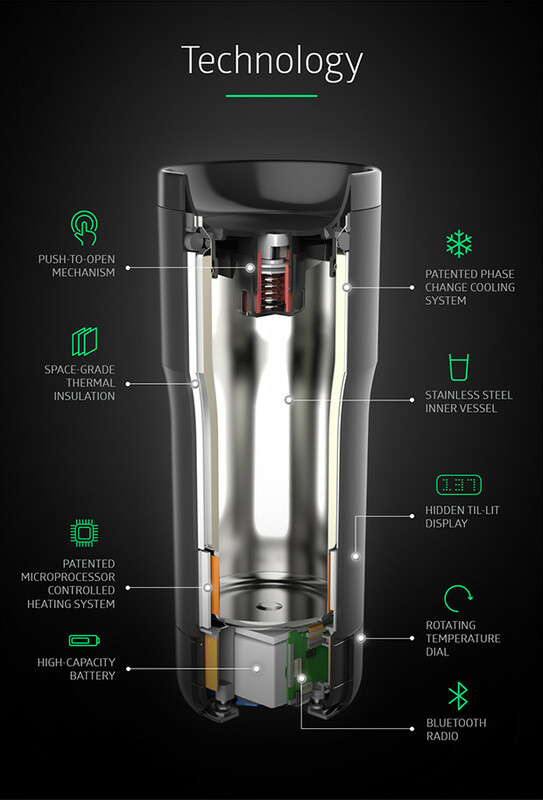 It may look like your standard insulated travel mug, but looks can be deceiving. Originally released in 2015, this older model carries the hefty price tag of $150. This first model does quite a bit. It has an LED display that shows everything from your name to the temperature. It has a way to touch open and touch close the opening. And you can choose your ideal temperature down to the degree. This is awesome because I like my coffee hot, but tend to be more sensitive to heat than other people. Previous products that try to solve the “cold coffee problem” were pretty much just heaters that heated up your drink indiscriminately. To this day, I am forced to use a microwave to heat up my cold mug. Ember warns however to not microwave this mug (there is no need, after all). They also warn to not put it in the dishwasher. The Ember CEO Clay Alexander (shown in the video above) said that they were following the Tesla model of business. Ember was starting with a limited edition, super high-end smart coffee mug, and then using the proceeds of that to do a high tech but slightly more affordable version down the line. The ceramic version keeps your coffee at your preferred temperature all day if plugged in and placed on the charging coaster. Or, if you have a meeting to get to, it will keep it hot for two hours. The ceramic smart coffee mug runs for $79.95 on Ember’s website. It addresses an annoyance I have of keeping my coffee at the perfect temperature. But for me personally, it has not hit the price point of whipping out my credit card and ordering right away. Until then, I will have to stick with my dumb coffee mug, and really cherish the 5 minutes that my coffee stays in the perfect heat zone. Or maybe I am just upset because I got this ugly sweater Christmas mug yesterday, found out about Ember today, and do not want to jump ship just yet. We’re living the lavish holiday life. You can be too, while knocking out all of your gift giving this holiday season here.